The folks at Fishidy got a hold of me about doing a guest post to introduce there mobile mapping technology. Typically, I wouldn't really have posts like these as they are in large part advertisement but I find this product quite fascinating and it's a technology that I have been trying to find for a quite a while and have heard a lot of discussion from other anglers who want something like this. With that in mind, I couldn't pass on the opportunity to share it with all of you! What do the Latest in Mobile Technology and Fishing have in Common? If you guessed “There’s an App for That!” you’d be right. But with all the fairly useless fishing apps on the iPhone and Android what’s different about this one? Well… maps, specifically 4000 interactive maps of waterways with underwater contours, structures, vegetation patterns and tens of thousands of marked fishing hot spots. The app is called Fishidy. Think GPS chart plotter, depth finder and catch logger with a little Twitter and Google Maps thrown in, all on your mobile phone at a fraction of the cost of on-board electronics and with features not available on even the most expensive models. In fact most of the features on Fishidy are free. Anglers are able to plot their location on the water with their smartphone or tablet, navigate to proven fishing grounds, mark their personal hot spots so they can be found again, locate areas likely to hold fish based on bottom contours and depths, find ramps, marinas, bait & tackle shops and share photos of their best catches and brag to their buddies. Fishidy is not just for the serious angler, on the water every weekend with all the gear and electronics, but also for the minimalist who only brings his phone and portable rod and reel, or the kayak angler with limited space and a serious love of fishing, or for the annual fishing trip where being skunked is not an option. It’s a great tool for fishing groups and for fishing unfamiliar lakes or coastlines because it comes loaded with so many maps with up to date and local fishing knowledge. 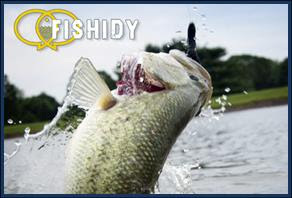 Fishidy.com is especially useful when planning a fishing trip, providing information on the best places to catch fish on each body of water, species to target, best time of year to plan trips, tackle recommendations and, most valuable of all, information posted by other Fishidy members about those waterways and the fish they caught there. Using Fishidy is as simple as taking a picture of that monster lunker with your smartphone, logging its location with a click in the app and it will show up on your, and your chosen buddy’s fishing maps as a “Catch” with your notes, including the tackle and fishing technique you used to land the beast, the time of day, year, moon cycle, weather, water temp, underwater structure and any other important notes about how you caught it, but most importantly exactly where you landed it. Best of all you can then brag to your friends and the world by sharing that catch with everyone on Fishidy or just your buddies or even keep it private if you chose. If you really think your fish is worthy of winning a contest there’s “The Fishidy Braggin’ Board.” Imagine a virtual Bassmaster Classic weigh-in where you get to hold up your monster bucketmouth for the roaring crowds while throwing down an “IYF” at your buddies and their puny catches. 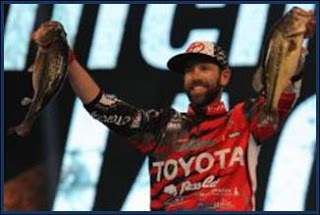 If the crowds vote for you, you could even win the Grand Prize, a VIP, all expenses paid trip to the Toyota Texas Bass Classic on Lake Conroe, TX. So, If you hate to hear “that’s why they call it fishing and not catching” take advantage of the latest in mobile technology, cloud computing and digital underwater maps to… catch more fish and never get skunked again, no matter where you fish. Isn’t technology great?! That's an awesome app! For someone like me who has terrible luck fishing, it just might be the tipping point! I remember being on a deep sea trip once(I am a casual angler) when everyone else got bites except me for the whole trip! I think the occasional angler like yourself is the perfect customer for this app. Let's be honest, the serious career fisherman isn't going to rely on a cell phone app for mapping - they have very expensive units made specifically for that function.